hi! just thought I would post these two pictures of the car we DIDN'T trade for the Subaru. our initial thought was to trade our Toyota sienna since it's the older car--but it's much easier for the clumbers to get in and out of, so we kept it and traded the prius. then we decided to upgrade the van and make it a little nicer for driving. we removed the center seats years ago, and made a sort of "floor" out of the extruded foam sheet insulation to cover up the brackets where the seats fit--it evened out the floor for the dogs to walk on. then we put carpet over that. so we got new carpet, a new (old)quilt to cover the bench seat where shambles likes to lay, and cleaned the bed and extra padding where dorijane likes to lay when she rides. then we got new seat covers for the front and took it to the car wash. we got some touch up paint too, for the scratches, and put one of those little clip on fresheners and a cheap steering wheel cover in too. 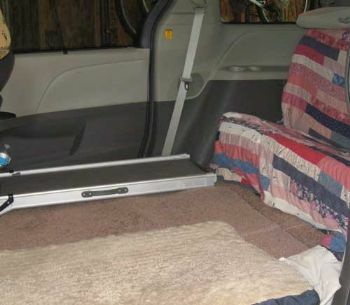 I want to get all weather floor mats and then it will be all set! Ha Ha I love the dog print seat covers. It's the dog's car. 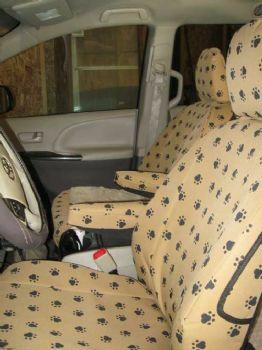 I like the seat covers with the paw prints on them! Always smart to have a dedicated vehicle just for the fur members of the family! You have a great day as well!! Nice!! Love those front seat covers! !